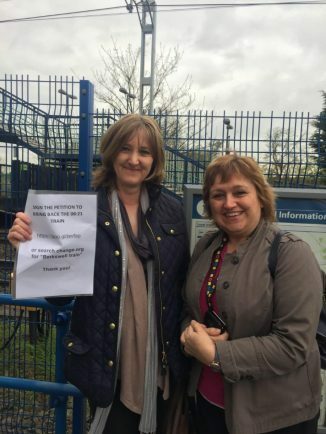 Rachel James (left) and Julie Woodfield with the Berkswell train station petition. THE INCOMING train operator set to take over the borough’s services from December has suggested any re-instatement of a commuter train from Berkswell to Birmingham New Street will have to await public consultation. In May, London Midland scrapped the 8.21am service to Birmingham New Street – which was so in demand that campaigners described it as being like the London Tube in rush-hour. Last week as we reported, Dame Caroline Spelman launched a fresh campaign to re-instate it – and improve the frequency of peak trains at Berkswell – following news that London Midland will cease as operators of the regional rail network from December. In advance of the takeover by West Midlands Trains, Dame Caroline has contacted its chief executive and Transport for West Midlands to request that they explore all possible options to reinstate the 0821 service. The decision to withdraw the four-carriage service – and bolster a 7.57 service to eight carriages – was made on the grounds that the service was ‘too busy’ and that this contributed to delays. A spokesperson for West Midlands Trains told the Observer this week: “When we take over the new franchise we will be updating the timetable to better reflect what people in the Solihull area want from their local rail services. “To help inform this process, we have consulted with numerous stakeholders in the region over the last 12 months. It did not comment further when pressed if the consultation would include the service from Berkswell to Birmingham New Street. In May protesting commuters said their family lives were being disrupted by the ‘bizarre’ scrapping of a peak-hour packed train – causing a ‘nightmare’ with the school run and working hours. Commuter and Berkswell mum Rachel James, who launched the petition with Julie Woodfield, told us: “Parents now have to drop off their kids very early at nursery or school. The petition stated: “London Midland have cancelled the 08:21 service which runs from Berkswell to Birmingham New Street. From 22/05/17, the services will only run at 07:57 and 08:40. “The 08:40 train arrives at Birmingham New Street at 09:02, making it unsuitable for morning commuters who start work at 09:00. “The change also puts a greater strain on the 07:57 service, as all current commuters will start to use this service. This service arrives at Birmingham New Street at 08:17, which is too early for people who start work at 09:00.